South Korea's state pension saw its dividend income from major listed firms jump nearly 20 percent on-year in 2018 as they returned more earnings to shareholders, data showed Monday. 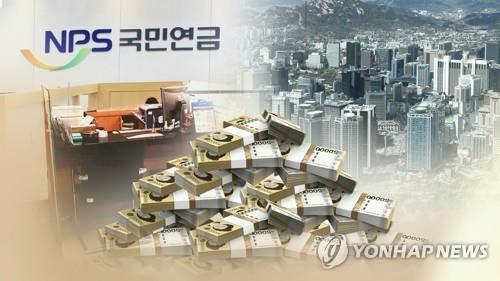 The national pension fund is estimated to have received 2.42 trillion won (US$2.13 billion) in 2018 dividends from 293 listed firms, in which it has a stake of 5 percent or more, up 19.9 percent from the previous year, according to the data by market tracker FnGuide and the Korea Exchange. The sharp increase was attributed to those firms' higher dividend payout ratios, or the proportion of earnings paid out as dividends to shareholders. Their average dividend payout ratio rose to 19.9 percent last year from 16.6 percent the prior year. The combined net income of those companies fell 2.3 percent on-year to 132.5 trillion won in 2018, but their dividend payments gained 17.3 percent to 26.4 trillion won. Top-cap Samsung Electronics Co. saw its bottom line grow 5.1 percent on-year to 44.3 trillion won last year, while its dividend payouts spiked 65.1 percent to 8.5 trillion won.